“THE MORNINGSTAR STRAIN WAS THE END OF THE WORLD. In the wake of the zombie apocalypse, two separate bands of survivors journey across a decimated America, each with the desperate goal of finding the cure for the virulent plague that threatens the existence of humankind—or what’s left of it. Now it’s up to these inheritors of the future to outlive their waking nightmare, any way they can. BUT FOR THESE SURVIVORS, IT IS JUST THE BEGINNING. 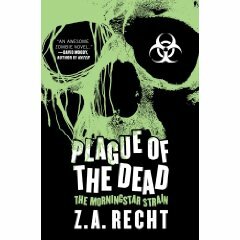 Permuted Press has announced that Z.A.Recht, author of Plague of the Dead and Thunder and Ashes, has died. This is shocking, horrible news. I never had the pleasure of meeting Z in person, but I talked to him by email as recently as last month. He seemed like a genuinely good guy – polite, funny and enthusiastic about all things zombie. Plague of the Dead has been picked up as part of a deal between Permuted and Pocket Books and is due to be re-released later this month. Such a shame that Z won’t be here to see it. My sincere condolences go out to his family and friends at this terrible time.